1 of 4 In a medium pot, combine quinoa and 3 cups water. Cover and bring to a boil. Reduce to a low simmer and cook 15 minutes. Let stand 5 minutes. 2 of 4 Meanwhile, heat a skillet to medium heat. Add bacon and saute 6 minutes, until crisp. Remove to a paper-towel-lined plate with a slotted spoon. Pour 1 tbsp of the bacon fat into a large bowl; discard any remaining fat. 3 of 4 Heat a grill or grill pan to medium-high. Toss peaches and chard in bowl with bacon fat. 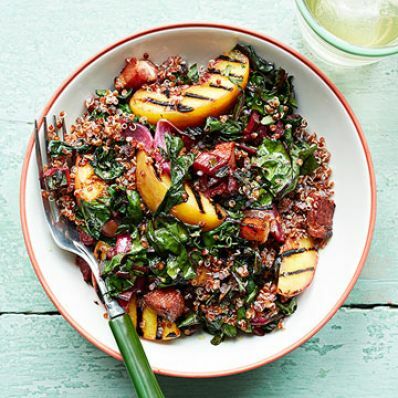 Grill peaches 3 minutes per side and chard 2 minutes per side (in three batches). Slice peach halves; chop chard. Return to bowl and toss gently with quinoa and bacon. 4 of 4 Whisk vinegar, oil, honey, mustard, salt and pepper. Gently stir into quinoa mixture.